WHAT IS THIS WEEKS GAME? In my first game in this set I’m going to cove one of my favorite games of all time. The Final Fantasy franchise as a whole is quite amazing. Every game is set in its own world and with its own story despite being numbered as a sequel. The franchise has always done that, but there are subtle carry overs from one game to the next, using every thing from mythologizes of mid-evil Europe, ancient Asia and the middle east, to even modern day pop culture and even the developers personal life’s. All these aspect have been forged together by the incredible talent of the franchises developers to make some of the best RPG franchises in the gaming industry and beloved by gamers for more than 20 years of gaming. Final Fantasy VII has you playing as Cloud Strife, a mercenary-for-hire doing a job for the environmental group Avalanche in the super city of Midgar. He is a cold and carefree ex-member of SOLDIER, a Special Forces Group of super soldiers the work for the giant mega corporation Shinra Inc. Shinra rules the world by controlling the worlds energy supply, Mako, which Avalanche claims in killing the planet and also control the worlds only military and weapons production. Cloud got the job from his childhood friend, Tifa Lockheart, Owner of the 7th Heaven Bar and Avalanche’s HQ in the Sector 7 slums under Midgar and friend of Avalanche Founder Barret Wallace. Shinra pumps the Mako out of the planet and uses it to make electricity and weapons that give the users magical powers. 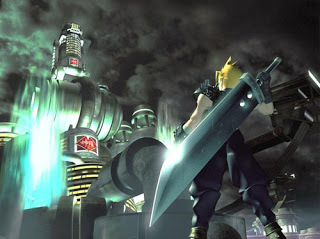 The first several hours of the game takes place in Midgar where you’ll meet plenty of interest characters before taking you to the open world where the game really takes off visiting Cloud’s and Tifa’s home town, a abandoned space rocket, ancient pyramid, meteor crater, ninja village, casino suspended over a prison, a reactor that had a meltdown, and that’s not even every place you visit. You’ll meet the Shrina Company’s President, a mad scientist, a pimp, serial murderer, Materia thief, fly a air ship, dress like a girl, defend a bird nest from the army, travel with a talking wolf, stop a runaway train, steal a submarine, and meet something akin to a vampire. That’s all just crazy cool fun in my book and just a sample of whats in the full game. The games battle system is a combination of two different system. First is the ATB (Active Time Battle) from previous games in the series. The ATB system was in the first game but has changed slightly with each incarnation, this is one of the primary ways the the franchise changes with each game. The original Final Fantasy uses just the ATB system with each party member having unique ability’s. Final Fantasy II, III, and so on changed slightly with each new release. 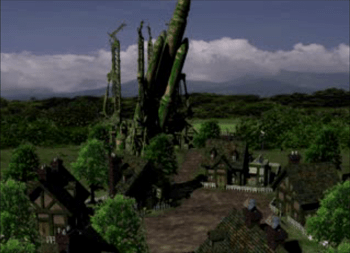 Final Fantasy VII’s unique hook is the second part of the combat system, the Materia System. In the game you collect or buy small colored gems called Materia, that you equip to you party’s weapons and defensive equipment. As you find and buy better gear, they usually have more open slot to equip Materia too. The Materia itself gives the character that equips it different ability’s, like casting various magic spells, specials skills like steal, or ability’s like a boost to their HP or summoning mythical beings for powerful attacks. 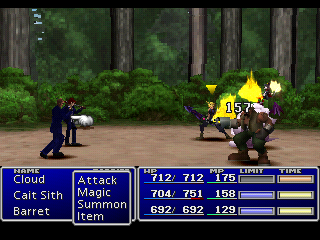 But its not just that simple a system, Materia can level up itself from fights with AP points earned. This will give you access to even more powerful spells, skills, and eventually it will master and create another piece of the same Materia. The most powerful Materia in the game can only be found so to get more of it you have to master it. Also some weapons in the game have really high stats but have little to no Materia slot or will have plenty of them but will earn no AP for the Materia equipped. There is a weapon for each party member in the game that has really high AP growth, but very limited slots to equip Materia in, so save them for use later when you have the better Materia you want to duplicate. 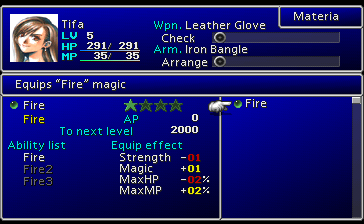 There is a slight effect to you characters stats with Materia equipped, so you have to watch it otherwise you’ll handicap a party member with slow speed, low HP/MP or other affect depending on the type of Materia used. Compared to some of the older franchise’s games, and even some of the newer ones, it is much easier to pick up and learn and more rewarding to master with no one ultimate setup. Final Fantasy VII was one of the first smash hits for the original PlayStation and opened many gamer’s to Role Playing Games for the first time. It was instrumental in the rise of Sony in gaming, showed the future of cinematic cuts scenes in video games when done right, was the second highest sell PS1 game and the highest sell game in its franchise. With a massive production cost of $45 million dollars in 1997 (that’s $67 million by today with inflation) this game easily becomes one of the first big budget games of the 1990’s. It was the first game in the franchise to have a direct sequel to its story, has had the most sequels to it in the franchise, a full length feature film (Final Fantasy VII: Advent Children), and to date has made Square Enix more than 790 million dollars. It won more than a dozen “Game of the year” awards in 1997, which is amazing considering it came out during a transition time when games were going from 2D to 3D. When the title started production in 1994 it was suppose to be a 2D RPG on the SNES (Super Nintendo), then the development team decided to push the technology of the time, very aggressively, which had them making a 3D title on what was supposedly Nintendo’s newest and most powerful console. But when Nintendo announced that their new Nintendo 64 was going to be a cartridge based system at a time when CD’s were suppose to be the future, Square Soft had already made a game so large it wouldn’t fit on a cartridge and they weren’t even done with production yet. This may seem like the obvious choice now but prior to 1997 most CD based console games were jokes at best and Nintendo ruled the game industry with a iron fist instead of making games and console based around crazy gimmicks. Final Fantasy VII is a must play for anyone that likes Role Playing Games and is still consider one of the greatest games of all time by many. I personally still play this game once a year and just never really get tired of it. So I hope you get on your Steam profile, or PlayStation Network and download this gem of gaming past and you’ll understand all the hype that was generated by the announcement of a remake of what is possibly the Best RPG video game of all time.